Harrison Ford May Keep Flying, FAA Investigation Concludes : The Two-Way After actor Harrison Ford landed his small plane on a taxiway, rather than a runway, at John Wayne Airport in Orange County, Calif., in February, the FAA began looking into the incident. Actor Harrison Ford listens during a State Dining Room event April 2, 2013 at the White House in Washington, D.C.
After actor Harrison Ford landed his small plane on a taxiway, rather than a runway, at John Wayne Airport in Orange County, Calif., in February, the Federal Aviation Administration began looking into the incident. Ford had mistakenly flown his single-engine private plane over an American Airlines passenger jet which was preparing for takeoff. No one was injured during the incident and American Airlines Flight 1456 took off for Dallas shortly after without incident. The Federal Aviation Administration determined at the conclusion of its inquiry that "no administrative or enforcement action was warranted," Ford's lawyer, Stephen Hofer said in a statement. "Mr. Ford retains his pilot's certificate without restriction." 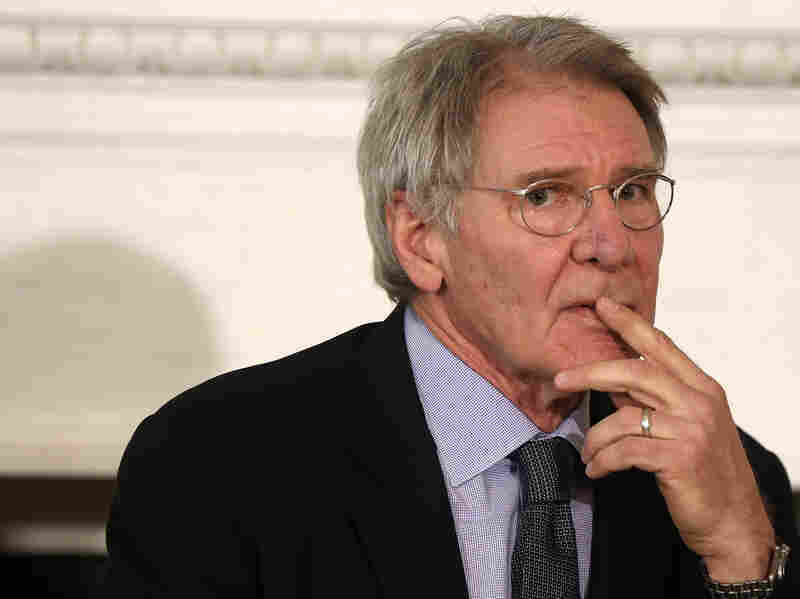 The actor, who played swashbuckling space smuggler and Millennium Falcon pilot Han Solo in the "Star Wars" film franchise, also was cited by the agency for his "long history of compliance" with FAA regulations and "his cooperative attitude during the investigation," Hofer said. Although Ford incurred no penalty, he agreed to undergo voluntary "airman counseling" before the FAA closed the matter, his lawyer said. Ford — of Star Wars and Indiana Jones fame — will retain his license without restriction. Ford's attorney also told news organizations that Ford didn't receive special treatment because he is a celebrity. The Los Angeles Times reports the taxiway landing is one of several mishaps and accidents Ford has experienced as a pilot. While training with an instructor in 1999, Ford made a hard landing in a helicopter near Santa Clarita while practicing auto-rotations, an emergency technique. The aircraft rolled over on its left side after coming down in a dry riverbed. No one was hurt. A year later, the actor was landing his single-engine Beechcraft Bonanza in Lincoln, Neb., when he ran off the runway because of a strong gust of wind. Neither Ford nor his passenger was hurt. The aircraft sustained minor damage. In March 2015, Ford crashed on the Penmar Golf Course in Santa Monica after his World War II military trainer lost power because of a carburetor problem. The actor sustained serious injuries, and the two-seat Ryan Recruit was heavily damaged.